Nearly all the tampan in the Museum’s collection are of a large size. In contrast, the scale of this cloth is comparatively small. Perhaps this reflects its specific function, or the skill level of the weaver, as there are a number of anomalies in the tampan’s design and execu­tion. The outer frame and inner bands of indigo blue are composed of repetitive patterns that are precisely spaced and well executed. Between these upper and lower registers, the pictorial center con­tains a riotous array of barely decipherable symbols, geometric conventions, and the bold rendering of otherwise familiar motifs. 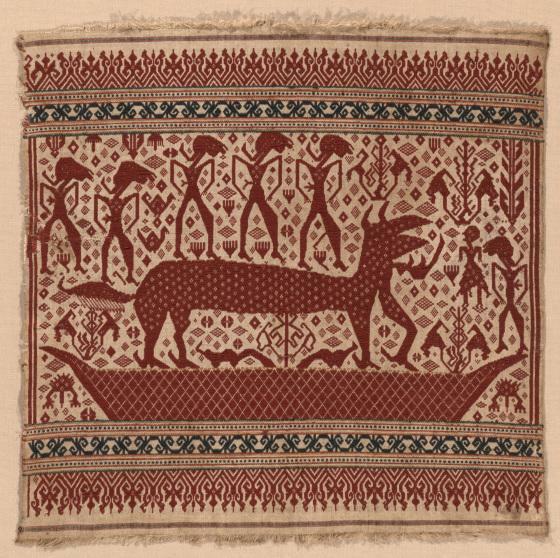 The unconventional arrangement of these motifs, and the fact that some of the secondary designs and minor animal forms are not fully realized, could suggest that this tampan was created by an inexperienced weaver still learning her craft. However, the overall result may also simply represent the mindset of a singularly origi­nal artist, more intent on conveying the main elements of her story than overly concerned with its surrounding details. Placed on a simplified boat with diamond-shaped lozenges is a lively beast. With splayed feet, seemingly neighing mouth, ears bent slightly forward, and a raised fluffy tail, it is vaguely equine but also utterly fantastic. The beast is dappled with diamond-shaped spots. Above, as though floating through this composition on arched feet, are five male figures. Each carries a ceremonial knife and wears a turbaned head wrap. This is most likely a coastal tampan, and the human forms and their attributes are depicted in a manner that reflects Javanese aes­thetics. The wayang-style figures underscore the interaction, trade, alliances, and the long suzerainty (overlordship) of the West Javanese Sultanate of Bantam over the elites of the South Sumatran coast. There, local rulers competed for and depended on the revenue and goods reaped primarily from the spice trade, especially from black pepper. Meeting the boat, its beast, and retainers is, presumably, an aris­tocratic couple. He is the larger figure on the far right. The female is skirted and her mouth is wide open as though she is staring in astonishment into the beast’s gaping mouth. The delivery of such a fanciful creature recalls the immense costs associated with life-cycle and status-raising ceremonies. Depending on the status of the person being honored, these ceremonies required the distribution of great quantities of food and goods, presumably even including exotic gifts, to obtain and hold onto prestigious titles and coveted privileges. While its exact function and narrative have been forgotten, the imagery on this tampan remains fresh and vibrant. Its central crea­ture, the human figures, and several of the more enigmatic details seem more animated than those found on most other tampan. Normally, the execution of motifs similar to these is more mathematically precise, sharper edged, seemingly stiffer, and more predictable. This is in part due to the physical properties of the supplementary weft technique, which makes it inherently difficult to convey a perfectly curving line or a sense of flowing movement. In this case, the textile’s main figures approximate, to some degree, the graphic spontaneity of the pyrographically drawn designs on Lampung rattan mats (1983.81) or those painted on Toraja textiles (see, for example, 1983.116; 1983.114; 2007.47; 1983.120). Steven G. Alpert, "Ceremonial cloth (tampan)," in Eyes of the Ancestors: The Arts of Island Southeast Asia at the Dallas Museum of Art, ed. Reimar Schefold in collaboration with Steven Alpert (Dallas: Dallas Museum of Art; New Haven and London: Yale University Press, 2013), 100-101.